Choosing between steel and graphite is a personal preference. Steel shafts offer the greatest amount of feedback and control during the swing, and are a bit heavier. Achieve faster swing speeds with lightweight graphite shafts and enjoy less vibration feedback. Therefore, if you suffer from golf elbow or arthritis, graphite is a better choice. Match your irons to your skill level. Players of the highest ability prefer muscle back or players irons. These produce the best response when struck correctly. For mid to high handicapped players, game-improvement irons produce better results on off-center hits. Muscle back irons are most often forged and used by better players. They require precision to play well. Although harder to hit, muscle backs are more consistent, swing after swing with easier shot-making capabilities. If you’re looking for more forgiving irons, try irons with a cavity back. 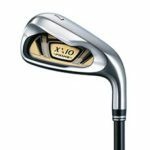 The design produces a wider sole and increased perimeter weighting, making it easier to hit for a wider range of golfing abilities. Cavity back irons can be forged, but are usually cast. These are also known as game improvement irons. Choose the number of clubs you will want in your bag. Decide on your shaft flex. Select the club head for your irons. Having a great set of game improvement irons can go a long way to saving you strokes and improving your confidence on the course. 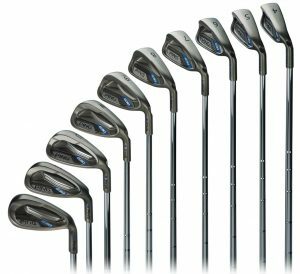 WGS has a remarkable selection of irons and iron sets for you to choose from. So for me a cavity back is perfectly fine since I am really still in the learning stages right? Or do I go ahead and think ahead with the muscle back. I definitely have my Christmas list made for my son 🙂 I am looking forward to a new set of clubs, and I can basically give him a lot more information thanks to your site! The cavity back is better for both of you. The muscle back irons are for more advanced players. The cavity back irons are more forgiving on miss hits. Thanks Koda for your comments. I agree that having your own set of personalized clubs will make a big difference for you. Be sure you get fitted by a good golf professional who is excellent in fitting you with the proper clubs and golf balls. Not all golfers are the same that is why a fitting is so important. Great information on golf irons and sets. There are so any to choose from and a site like this is welcoming to help all us golfers choose golf gear. Do you prefer cast or forged irons? 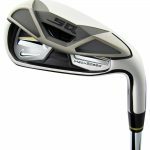 A lot of golf irons being made these days are cast, but technology has advanced and there are now forged golf clubs which are quite forgiving. Callaway and Mizuno are two manufacturers that have done this recently. Thanks Chris for your nice comments. I don’t have a preference for cast or forged irons. Both have advantages. Currently, I play a set of cast irons by Calloway but in the past I had been playing forged irons. I am happy with my current set but was never disappointed with my forged sets. Both play very well for me.